I've never been mushroom hunting before, largely because I'm terrified that I will misidentify the mushrooms I find and poison myself. So, it was with a bit of trepidation that I accepted some wild oyster mushrooms from a friend last week. I had been reading a lot of posts and seeing pictures of these mushrooms on the Oklahoma Wildcrafting Facebook group page, and the mushrooms that my friend gave me looked just like those. In addition, he is an experienced gatherer of wild food, so I felt relatively secure I could eat these mushrooms and not die. Some of them were huge! First order of business was to trim away the tough neck or stem or whatever it is called. You can see it better when the mushroom is turned over, gill side up. Here's the mushroom with the neck trimmed away. Next, chop the mushrooms into bite-sized pieces. Then, put the chopped mushrooms into a skillet with some olive oil or butter. I have a well-used wok that I like to use. I threw in some chopped garlic too. I have to tell you these were the best mushrooms I have ever eaten! I had enough for several meals, so I froze some of them. To freeze them, I cooked them in olive oil and then put them in freezer bags. However, I understand that you can also dry them. After seeing these mushrooms first-hand, I felt confident that I could identify them in the wild. From what my friend told me, they grow on dead trees, usually cottonwood or willow trees. So, I took a walk over to the creek near our house and, sure enough, about half-way up a dead tree that was leaning out over the creek I saw several of them. Unfortunately, they were not within reach and I was not able to get them. We've been feeding the deer during the winter for several years. This winter is no exception and I want to share a few pictures of our resident deer. They show up regardless of what the weather is doing or whether it is a holiday (for humans). Here they were early on Christmas morning. This is the first time we've had escaped cattle come to the feeder. We aren't even sure who they belong to, but I think whoever it was must have found them because we have not seen them today. I'm sure they were not happy to be out rounding up their cows on Christmas morning! Deer are most active at night, but many days they show up in the early evening, like this group. They are beautiful animals! They appear to live in small groups that consist primarily of does and yearlings. One group lives in the cedar trees in the background. Another group lives in the woods on our neighbor's property. When the groups meet, it is not always friendly. Notice how the doe on the left below is striking out with her hoof at the one on the right, a sure sign of aggression. The bucks normally separate from the does when they reach a year of age. Young ones sometimes pair up, like the two below. The guy on the right is called a "spike" buck because his antlers are not branched. He is likely to develop branched antlers when he is older, just not this first year. We caught this pair on camera having a friendly shoving match, practicing for when they are older. We have one or more older bucks that we see occasionally. Whereas the groups of does come to the feeder almost every night, we don't see these guys every night. Whenever a buck comes to the feeder while a doe group is there, it causes quite a stir, even if it is one of the young bucks. The doe group scatters and lets him have the feeder to himself. We never know what we are going to find on the wildlife camera. It is like opening a Christmas gift to see what is inside. Merry Christmas! A couple of weeks ago I wrote an entry on using soapberries to make a mild detergent. I learned about soapberries from a Facebook group called Oklahoma Wildcrafting. Another thing I have learned by keeping up with this group is how to use native sumac seeds to make a kind of spice that has a tangy lemony taste. 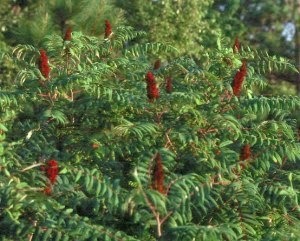 There are many varieties of sumac, including Poison Sumac. You don't want to eat that! In general, the varieties that have red berries are edible. 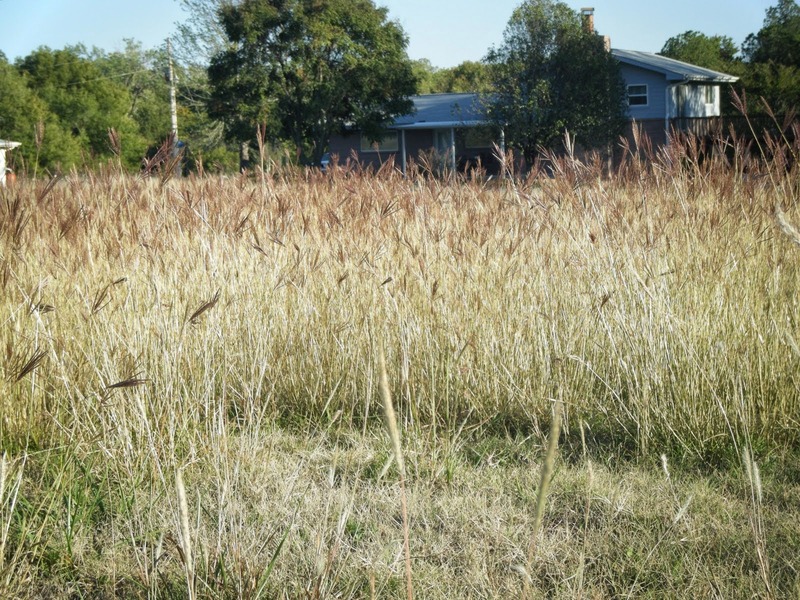 The following is a picture of the typical native sumac shrub that grows along the roadsides and in the fields here in Oklahoma. The spice is made from the seeds that make up the red clusters, like you see above. Here's one of them. Here's how to make the spice. First, remove the seeds from the stem. This can be quickly accomplished by rubbing the bunch between the palms of your hands over a piece of newspaper. Then, pick through the seeds and remove any bits of stem and other debris. Next, put the seeds in a mortar and grind them until the red coating comes off. Pour the mixture into a sifter and shake the bits of red seed coating into a dish. It is the seed coating that you want for the spice, not the inner seed. At this point, a lot of the seed coating may be too big to go through the sifter. So, you can pour it back in the mortar, regrind and re-sifted it again. Some of the seed coating may stick to the inside of the mortar. You don't want to waste it, so use a pastry brush to brush this out. Finally, pour the spice into an empty spice bottle and label it. I sprinkled the spice on sugar cookies before baking. This gave them a delicate lemony taste that was delightful. I found many other recipes for using this spice on the internet. It appears to be used a lot in Middle Eastern cuisine. If you are interested in making your own sumac spice, the following Eat the Weeds website is very informative and tells how to make a type of "lemonade" from the berries. Dill is an annual and does best in cool weather. As the weather heats up, it quits producing foliage and sends up flower stalks. The flowers themselves are tiny, but grow in clusters that are several inches in diameter. These are sometimes used in canned dill pickles. 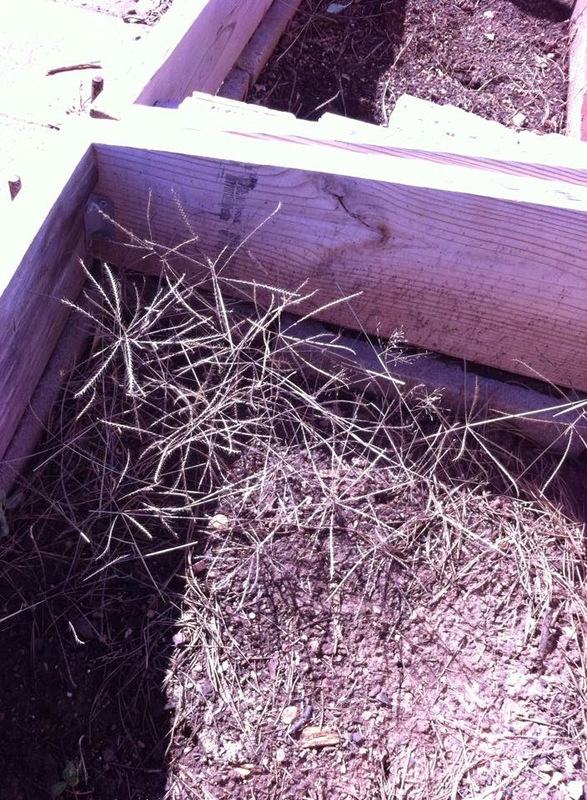 I planted dill in the spring, enjoyed it while it lasted, and left it to make seed. In September, I was rewarded with a second crop that grew from these seed. I preserved much of it for winter use by drying it in bunches. 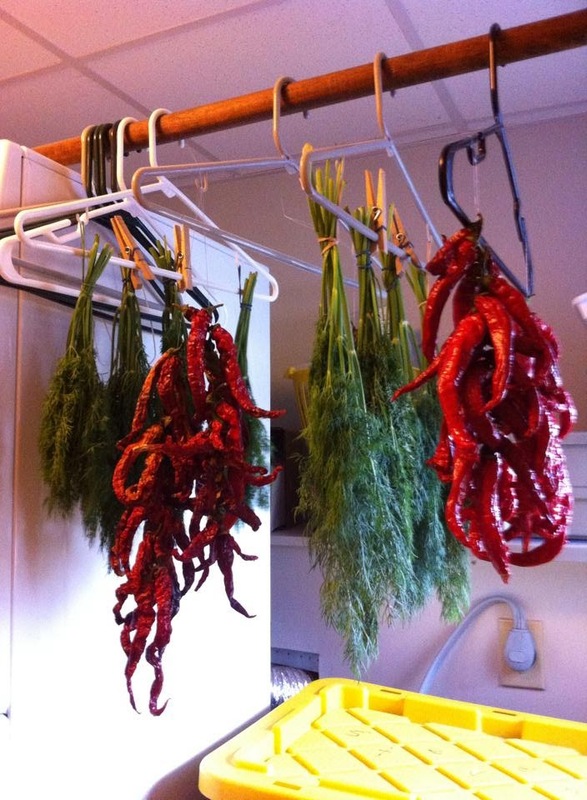 Hangers in my laundry room made excellent drying racks for both dill and cayenne peppers. Put them in the food processor and pulsed them until they looked like this. There were a few errant stems that had to be discarded and the remainder was sealed in a plastic bag ready for use. Over the last couple of years, I've become interested in native plants that can be used as food or for other useful purposes. I've even joined a group on Facebook named "Oklahoma Wildcrafting". This is a group of very knowledgeable people from all over the state who are interested in foraging wild edibles, mushrooms and herbs. This fall I learned about "soapberries" through this group. These come from a tree that is native to Oklahoma and Texas called the Western Soapberry tree. Here is some information I found on the web about these trees. Note that, while the name implies the fruits are berries, I don't believe they technically are berries in the true sense of the word. However, for this article, I will refer to them as such. As you might guess from the name, the fruits can be used to make a kind of soap. Here's a picture of what they look like up close. They are really quite pretty. The dark centers are the seeds. The berries contain chemicals called saponins which foam when water is added. This foaming property makes the berries useful for cleaning, but also makes them toxic when taken internally. So, pretty or not, DO NOT eat these! I ran across a lot of different recipes for making laundry detergent from the berries. Some of them called for cooking the berries. Others said to just soak the berries in tap water for a period of time. I decided to try one of the "cooked" recipes and ended up taking an average of a couple of these. Here's what I came up with. First, I combined 20 soapberries with 3 cups of water in a saucepan. Then, I brought the water to a rolling boil and turned the heat to medium for about 20 minutes. Notice the foam. Next, I let it cool a bit and strained the berries out of the liquid using a medium sieve. I then poured the liquid through a finer sieve into a glass bottle. Most of the recipes said to keep it in the refrigerator to keep it from spoiling. Some of them even suggested sterilizing the container. All the recipes said they made a mild, low-suds laundry detergent that only required 2 or 3 tablespoons per load. I've used it for a couple of loads of laundry and it seems to do a good job.